After this it was sheer travel along the North African littoral, and the Mediterranean, and Sicily, and Greece. This: Tangier. This: the death of Don Lewis. For us it has not been sheer travel, but some of the travel has been littoral. We skirted the Spanish Atlantic littoral, ducking clouds and mist aboard a narrow-gauge train. We skirted the French Mediterranean littoral in the bourgeois comfort of the TGV. And then we got into boats, into the salty, dark mood of my favorite novel. These scenes of the last three weeks before the catastrophe were the scenes that Finnegan painted for the rest of his rather short life, whenever he was in the condition or mood to work at this trade: sky blue splendor, as seen through the eyes of one who was member to both the human races, and the aspect of death behind the beauty. We have tasted that sky blue splendor. 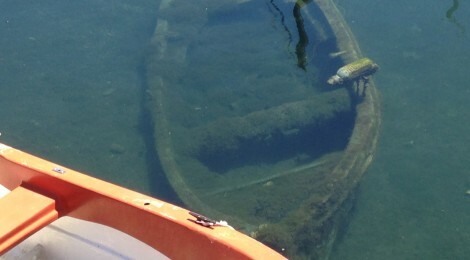 It caught up to us in Marseille and has followed us, as it followed Finnegan, to Sicily. At Palermo Finnegan was in his glory and talked Italian with every idler who would join him, until he found out that Papadiabolous could do the Sicilian better than he. Three sidewalk idlers in Palermo quietly pass the hours. No one is remarking at our Sicilian, though everyone seems pleased when we start every conversation with something like: “You excuse me. My Italian bad. Very bad.” They give a wave of their hand, lengthen their patience, and try to understand. What we can do is join the idlers. The sun is warm, the shore near, and the narrow ways of Palermo (Some should not be called streets.) so narrow that none should move their arms with energy lest they be bruised against a stone wall. 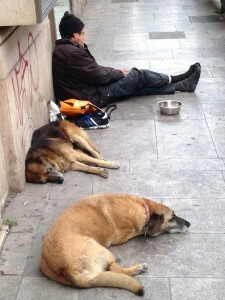 We join the idlers at coffee near Piazza San Dominico. (“Want a pistachio roll with that?” “Of course, but no rush.”) We join other loafers with glasses of wine not far from Teatro Massimo. Near the wharf at La Cala—surely this is where Seaworthy’s yacht the Brunhilde would have docked—we stare into the water alongside the men who dangle in hooks without bait. At Palermo also Finnegan got his mail for the first time since leaving the States. No matter how he got it, he got it: letters from this other life, from friends in New Orleans and St. Louis and Chicago; also one from Mr. X from nowhere at all. But it was a thing peculiar here: Finnegan now doubted that it was himself who lived that other life; these cherished friends were as those known at second hand, known to somebody else and the knowledge merely transferred to him. 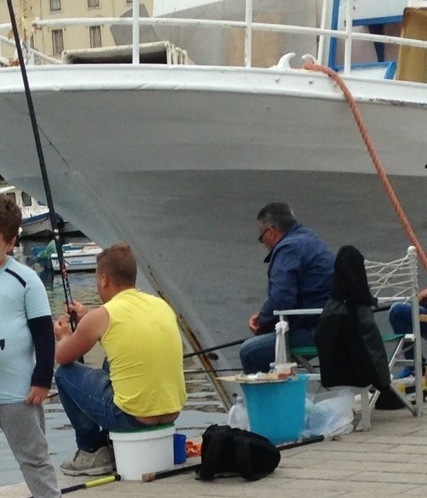 Men fishing along the quay in Palermo. Bait optional. While we are here, an e-mail arrives from a far-away friend. Her love is evident in her words, her need to write. Yet something about Palermo, something about being on this island, something about distance and time taken to reach an island, give that love and our memory of love an uneasy fermata. How can we have participated in something where seemingly plausible questions arise without effort? It seemed not the Finnegan here present who had been in that other life; it was some other Finnegan in some other context. Who are we now? Who will we be when next our mail arrives? Author’s note about an author’s name. 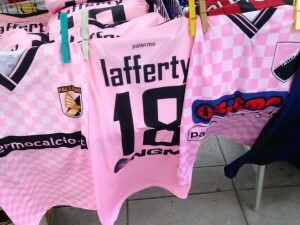 The soccer jersey for Irish-born forward Kyle Lafferty on sale street side in Palermo. What?! They love my favorite book’s author that much? No, It’s a soccer jersey. One of the team’s stars is young Irishman named Lafferty who appears to love this rough-cut town.